Get ready – the natural wine phenomenon is about to hit Poland. Natural wine? It means wine made with grapes, and nothing else. The natural wine credo is absolutely no chemical intervention and minimal technological intervention in growing grapes and making them into the good stuff. On June 16, Krakow will welcome a legend of the natural wine world, Frank Cornelissen, and some of the most interesting and sought after natural wines to reach the Polish market. Frank is a Belgian-born winemaker whose search for the perfect terroir led him to the active volcano of Mt. Etna on the island of Sicily about 14 years ago. In the EU, a bottle of wine can contain more than 100 additional ingredients before it is sent to the market place, to be eventually consumed by you, not to mention the numerous chemical treatments allowed in vineyards. Frank’s wines have only one ingredient: grapes. Those grapes are grown without pesticides, fungicides, herbicides, or any other treatment. Once in the winery, the grapes are left to ferment with their own native yeasts, the very best way to allow grapes to express their origin. The resulting wine is bottled without clarification or filtration. Nothing is taken from Frank’s wines, nothing is added to them. Every vintage produces an interesting and unique interpretation of what nature has to offer. The annual production is around 25,000 bottles, depending on the generosity of the vintage. 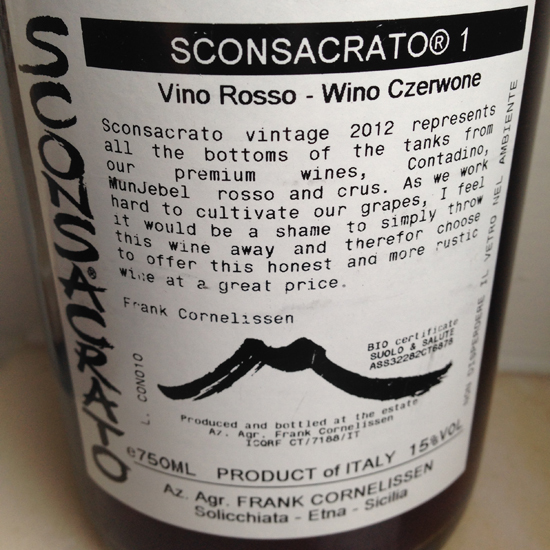 Poland will receive only around 600 bottles of Frank’s wines this year, including the Poland-only wine called Sconsacrato 1, the first ever labeling of this wine. If you’re interested in trying the Sconsacrato 1 and Frank’s other natural wines, join us on June 16 at 20:30 at the Naturaliści wine shop (10 złoty nominal fee for participating). Naturaliści is a new wine shop focused exclusively on organic, biodynamic and natural wines that are selected, purchased and imported directly from the producer. See you there! Mt. Etna’s extremely variable climate results in broad vintage variations, and 2012 produced wines of incredible concentration. The hand harvesting of the grapes was finished on October 23 (very early for Etna). The Sconsacrato 1 was produced by blending the last drops of wine from a base wine, Contadino, with the mid-range Munjebel and top-range Munjebel Cru wines. The wine is bottled without fining or filtration, so there is a natural sediment. On the nose the wine is rich and fragrant, bringing to mind the great red Burgundy or Barolo from Piemonte. On the palate, the wine has the body of Etna, with hints of volcanic ash and a great drinkability that is typical of Cornelissen’s wines. It has power, but also the delicate sweet notes typical of the Nerello Mascalese grape (which makes up a large percentage of this wine). Thanks for your positive words! You are right that Poland is lucky to get a taste of natural wines, and especially the wines of Cornelissen! 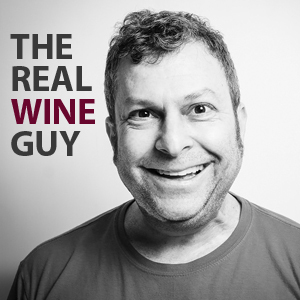 Frank only agrees to introduce his wines to a new market when he has the “surplus” because he doesn’t believe in taking away from other established markets! If you are in Poland soon, come pay us a visit !